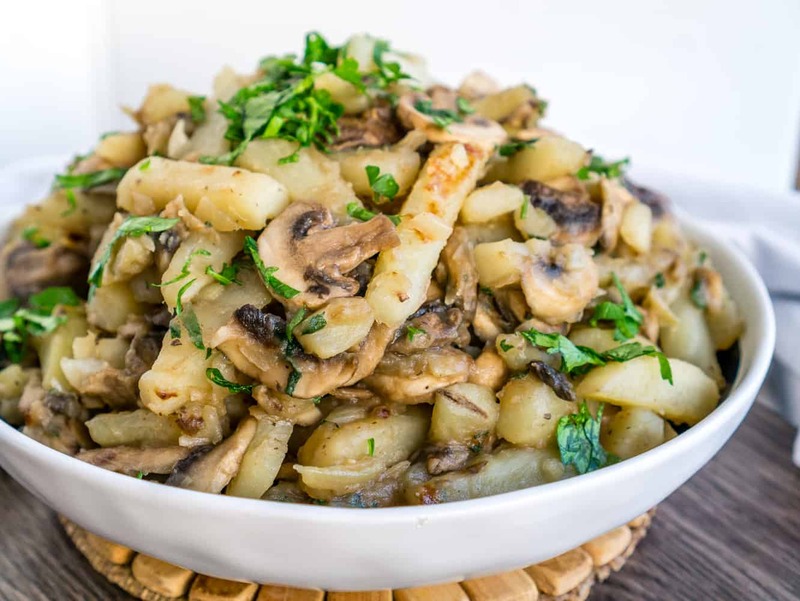 An easy side dish of Sauteed Potatoes with Mushrooms that is sure to please everyone – from picky eater kids to set-in-their-ways adults. Serve this potato dish with chicken, steak, or seafood. OK, it’s probably unfair to stereotype all Russian grandmas, but mine is exactly like that. It’s not her fault. It’s just that she is used to the foods she grew up with and ate her whole life. Anything else is too exotic or spicy for her. When I am cooking for my grandma I always have to make sure I stick to the basics: potatoes, bread, fish are all safe bets. So when I find a recipe that everyone will love, I put it on repeat. 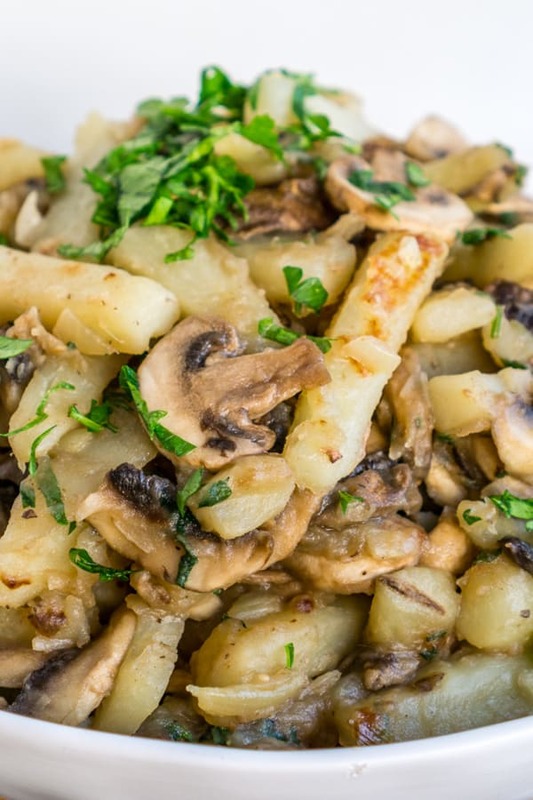 This side dish of Sauteed Potatoes with Mushrooms is very simple to make in one pan. 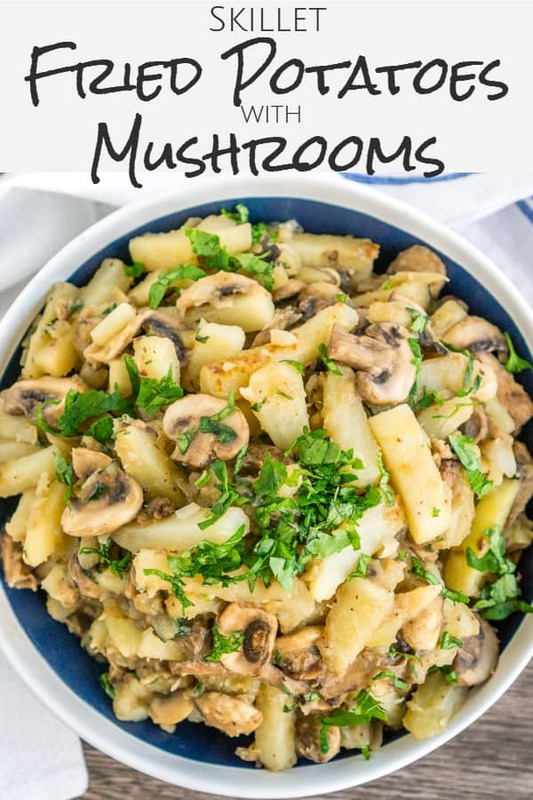 It only has three main ingredients: potatoes, mushrooms, and onions. It has a simple flavor, but that is a good thing. Comfort food should be simple. Potatoes are potatoes, ya know? What else is there to say? If you want, you can spice this recipe up a bit: add a pinch of red pepper flakes, or a dash or Italian seasoning. 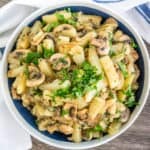 You can try using different herbs instead of parsley. Serve this potato side dish with steak, chicken, or seafood. And of course, don’t forget to add a salad or some roasted vegetables to get a few more nutrients in. My toddler son loves these potatoes, my grandma loves these potatoes, my husband loves these potatoes, and I love anything that they will all eat without being picky. Win win win! 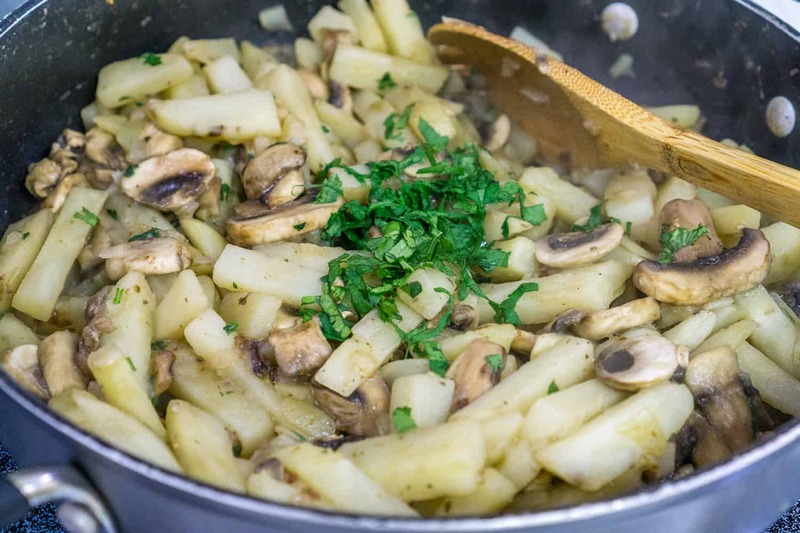 Chop the potatoes into thin strips, about the size of French fries. Roughly chop the onions (no need to have perfect even pieces for this recipe!). Slice the mushrooms. Add the potatoes and onions to a preheated skillet with olive oil. Cook undisturbed for a few minutes, so that the potatoes get nice and crisp at the bottom. Then saute for about 5-8 minutes before adding the mushrooms. Continue to cook until the potatoes are fully cooked through. Stir in some fresh parsley (or any other herb you love!) and that’s it! 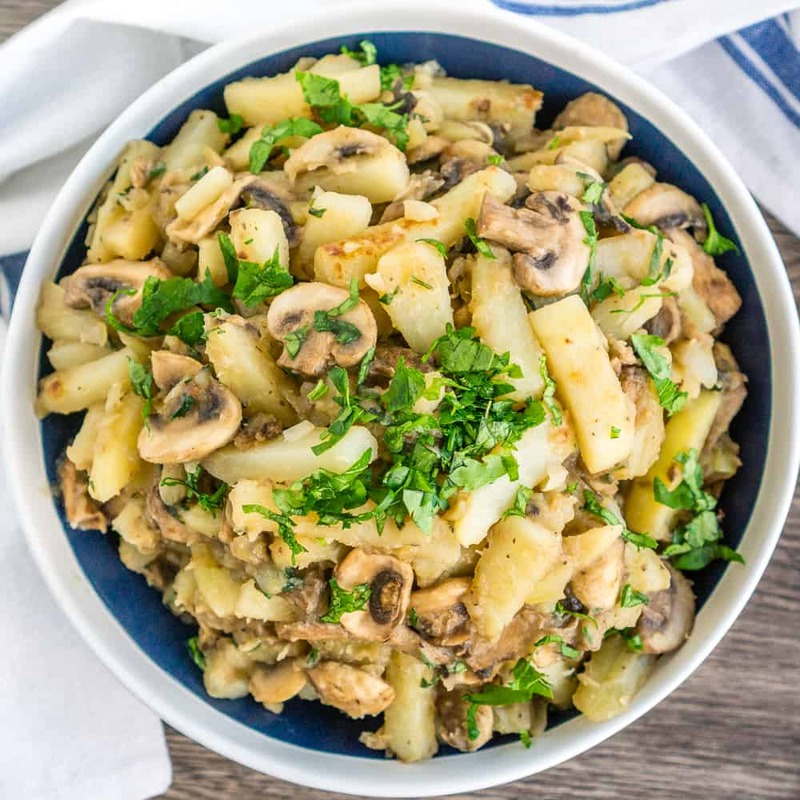 An easy side dish of Sauteed Potatoes with Mushrooms that is sure to please everyone - from picky eater kids to set-in-their-ways adults. Serve this potato dish with chicken, steak, or seafood. Prep all the ingredients. 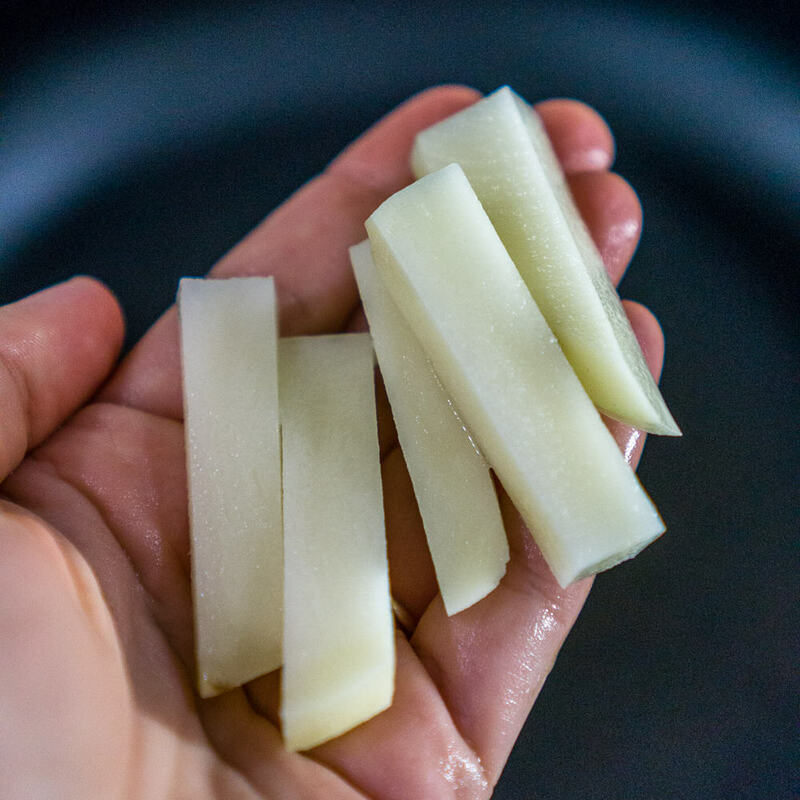 Prep the potatoes: Peel the potatoes and cut them into 2-3 inch pieces about the width of a French fry. Dice the onion. Clean and slice the mushrooms. In a large skillet with a lid, heat the olive oil. Add the cut potatoes and diced onion. Cook over medium-high heat for about 3-5 minutes without disturbing, so that the bottom layer of potatoes get nice and crispy. Season with salt, stir and cover with a lid. Continue cooking for 5-8 more minutes, stirring every few minutes to prevent burning, and covering with a lid in between stirring. Add the sliced mushrooms and stir. Cover with a lid, and cook for 5 minutes, stirring once or twice. The mushrooms will release some juice, this is fine. Remove the lid, and continue cooking for another 5 minutes stirring frequently, or until the potatoes are fully cooked and any liquid has evaporated. Stir in parsley and remove from heat.